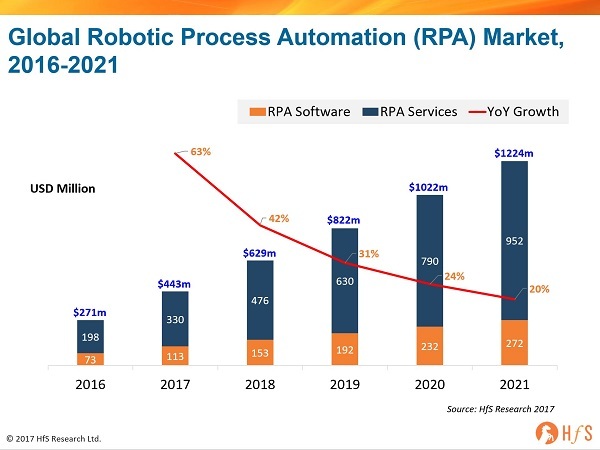 ORLANDO, Fla., Oct. 4, 2018 /PRNewswire/ -- According to Hfs Research, the global market for robotic process automation (RPA) software is expected to grow from $629M this year to $1.2B in 2021. While RPA is typically viewed as a way to reduce costs, a recent study by Capgemini showed more than a third of surveyed financial institutions attributed a 2-5% revenue growth directly to an intelligent automation strategy that includes RPA. EnableSoft Inc., creator of Foxtrot robotic process automation (RPA) software, confirms that more and more credit unions are leveraging RPA software to boost efficiency, increase accuracy and, most important, boost the bottom line. For example, Texas Tech CU ($180M in assets, 21,000 members) recently merged two credit unions. The credit union was able to replace merger services provided by its core data processor with Foxtrot RPA. "Over the next couple of years, we'll be able to reduce the cost of mergers by about 80% thanks to Foxtrot," said Pranay Siri, the credit union's Business Intelligence Analyst. And of course, every merger leads to a revenue boost for the acquiring institution. Kalamazoo's Consumers CU ($1B in assets, 90,000 members) is actively engaged in selling its loans, typically bundling as many as 500 loans for sale at one time. Prior to deploying Foxtrot, the credit union had to manually prepare each loan for sale. "Using Foxtrot, we've been able to eliminate several days' worth of manual data entry for every group of loans we sell," said Allen Hughey, the credit union's loan servicing manager. That inevitably leads to more loans sold in a shorter period of time. At Provident CU ($2.4B in assets, 116,000 members), the credit union initially began using Foxtrot to close inactive credit and debit cards. However, according to Document and Image Retention Manager Amanda Seals, its greatest value is in the escheatment process. "In the escheatment process, you really cannot have a single error," said Seals. "Sure, Foxtrot saves us many, many hours of manual processing, but accuracy is just as important. We've never had an error processing escheatments with Foxtrot." "The possibilities really are endless for RPA software," said EnableSoft CEO Richard Milam. "We've seen credit unions using Foxtrot for everything from managing CAMS alerts to post-conversion data cleanup to automating the interaction between unlike technology platforms."